NYCHS presents a report by Roger Larson on his research into the case of James McLean, the man reputedly "hanged twice." Eleven days after the slaying of William Orr and Archibald MacLachlan, a Genesee County coroner's inquisition [inquest] was held in Southampton that today is called Caledonia and is seated in Livingston County. The following text, copied from the coroner's document among Genesee County records, describes in vivid detail the fatal axe blows suffered by William Orr. Note: John Cameron, the tavern owner at "The Springs," was one of the jurors. The document from which this text was copied by Roger Larson is among the Genesee County records he researched in gathering the information that he shares with NYCHS web site readers through this presentation. 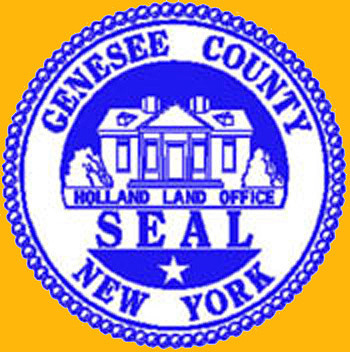 For Genesee historical background, click the seal above to access the county's official site. of which said mortal wounds the aforesaid William Orr then and there instantly died; and so the said James McLean then and there feloniously killed and murdered the said William Orr against the peace of the said people of this State and their dignity. And moreover the jurors aforesaid upon their oath aforesaid, do say that the said James McLean had not nor hath any goods or chattel lands or tenements within the County aforesaid or elsewhere, to the knowledge of the said jurors. John Cameron, the tavern owner at "The Springs," was one of the 1807 inquest jurors. 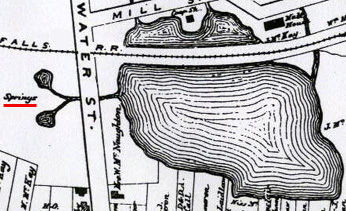 Interestingly, the 1872 Caledonia map showing the location of "The Springs," (red underline added for emphasis to detail above) includes a section listing "Business Notices." First entry is for D.E. Cameron, Justice of the Peace. (See detail below, red arrow added for emphasis.) 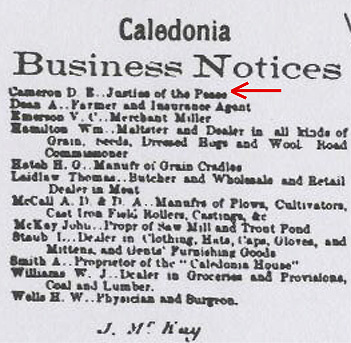 In 1899, a Caledonia committee erecting a soldiers memorial monument included Justice of the Peace Duncon D. Cameron. In witness whereof, as well the aforesaid Coroner, as the Jurors aforesaid, have to this inquisition put this seal on the day and year aforesaid and at the place aforesaid. Return to main text The Man Who Was Hanged Twice page by Roger Larson.